A volunteer from Parks and Recreation gathers trash from the banks of the Schuylkill River at Bartram's Garden. Tires, TVs, lots and lots of plastic bottles and ... a check for $32,000? You never know what you’ll find when picking up trash along Philly’s rivers. Sponsored by the Philadelphia-based and “ocean-friendly” clothing company United By Blue, the volunteer effort was the first of a number that will be held along area rivers this spring. During yesterday’s event, staff from Philadelphia Water, Parks and Recreation, the Schuylkill Action Network, United By Blue and the green infrastructure design and maintenance firm AKRF gathered 3,372 pounds of trash from the river banks in less than two hours. The event was also the first official “Schuylkill Scrub” of the year. Schuylkill Action will continue to host their signature litter removal gatherings throughout the Schuylkill River Valley from March 1 to May 31. Learn about participating in the next Scrub here. 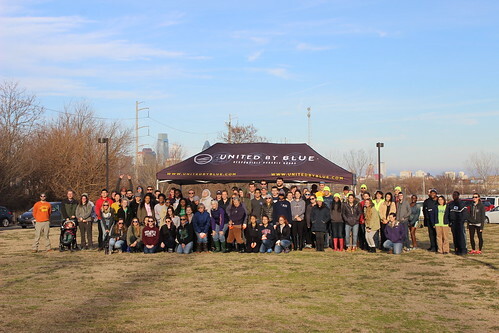 Philadelphia Water and United By Blue will also be partnering to host a number of watershed-focused cleanup events this year, including two on the Delaware River in April and May. Sign up here to help get trash out of our waterways.